There are a few interesting features to the house. There is a narrow alleyway on the left side of the shop which passes through the building to the back. In 1868 when the property was put up for sale it was said to have a stable so this passageway must have been used by the horses. The same advert shows there was a Summer House. We suspect that this is the two storey ‘tower’, now dilapidated, at the bottom of the garden. There are signs of this outbuilding having at least one fireplace and windows. In an oral history interview Madge Horder who was born in the property and lived there for many years, recalled there was a double seated toilet down the bottom of the garden underneath what was the tower. She explained that someone came once a week to pull up the buckets and carry them through the print office to the front of the building. In the deeds George Luce is shown as being the earliest owner and occupant of 22 High Street and the earliest document is George’s last will and testament dated 1821. This will shows that the property was then considered to be part of Tithing of Kington within the Parish of Thornbury and near to the Borough of Thornbury. Using the Kington Land Tax records we have been able to trace the property from late 1700’s when it was occupied by Richard Luce. Richard and Sarah Luce – the Kington Land Tax records of 1780 to 1784 show that Richard Luce owned and occupied a property in Kington. His property was listed next to Daniel Pitcher whom we believe lived at 24 High Street. According to a family tree on the Ancestry website Richard was baptised on 14th February 1740 in Rockhampton and his parents were Thomas and Elizabeth Luce. On 24th February 1762 Richard married Sarah Grove, the daughter of John Grove, the butcher and his wife, Anne (nee Cossham). Richard and Sarah had several children: John born on 12th September 1762 and baptised on 6th October 1762, Amelia born on 10th January 1765 and baptised on 13th February 1765, George born 31st May 1767 and baptised on 16th June 1767, Roger born on 24th January 1770 and baptised on 14th February 1770, Anne baptised on 22nd February 1771, another son Roger born about 1774 and William born on 7th March 1778 and baptised on 11th April 1778 when he was noted as having convulsions. The baptism records show Richard was a barber or peruke maker (a wig maker). Of these children, the first Roger died as an infant, the second Roger died aged 3 and was buried on 12th February 1777, William died as an infant and John died aged 21 and was buried on 12th September 1784. Richard died aged 47 and was buried on 27th December 1786 and Sarah died aged 49 and was buried on 14th March 1790. George and Mary Luce – it appears that George inherited the property from his father (see above). The Kington Land Tax records of 1800, 1810 and 1824 show George as the owner and occupier of the same property next door to Daniel Pitcher. George married Mary Dyer at Olveston on 1st August 1799. Based upon her reported age at her death Mary was born about 1778. George and Mary settled to live in Thornbury and had several children there: Sarah born on 16th August 1800 and baptised on 14th September 1800, Ann born on 9th October 1802 and baptised on 14th November 1802, Mary born on 27th April 1804 and baptised on 3rd June 1804, Harriett born on 11th March 1808 and baptised on 31st October 1810 and John born on 29th June 1806 and baptised on 27th June 1806. The baptism record of Harriett shows George was a barber. We were interested to see a reference to George in the records of expenditure incurred by Thomas Hendy in 1822 in his role as executor of his father’s will. George charged five shillings for shaving the deceased. Of these children, John died on 9th November 1807 aged 16 months and Sarah died on 28th July 1815 aged 15. George died on 7th November 1823 aged 56. In his will dated 29th September 1821 George described himself as a peruke maker. He left his house and his estate in trust to Mary during her lifetime or widowhood. After her death the estate was to be divided between his three children, Ann, Mary and Harriett. In the event Ann pre-deceased her father and died on 7th March 1823 aged 20, without having been married. George also bequeathed his ‘little gun, gun box and all thereto belonging to Edward Salmon Junior, son of Edward Salmon surgeon’. The Land Tax records show George’s widow, Mary, carried on living in the house. Mary Luce, George and Mary’s daughter, married Thomas Hodsoll in Thornbury on 31st May 1827. She died on 9th August 1843 having had five children: George Luce baptised about 1828 who went to China in 1844, Harriet Luce baptised in 1832 who married Ellis Chambers, Lucy Victoria born in Trowbridge in 1838 and married James Tooley and Albert born in Marshfield in 1842 who left England in 1856. The 1840 Tithe Survey shows us that the property was Plot 65, a house and garden owned and occupied by Mary Luce. The 1841 census shows Mary Luce living in 22 High Street. She was described as “independent” aged 60 living with her daughter Harriett Mawley, an artist aged 30, her grand-daughter, Harriet Mawley aged 5 and an auctioneer James Neate aged 60. In the 1851 census Mary Luce was a landed proprietor aged 72, her daughter, Harriet Mawley, a married lady aged 43, and grand-daughter, Harriet Luce Mawley aged 15 who was a scholar at home. The 1861 census shows Mary Luce still living at 22 High Street. She was described as a fundholder aged 83 born in Rudgeway, living with her daughter, Harriett Mawley, a proprietor of houses aged 55 and grand-daughter, Harriett Luce Mawley an embroiderer aged 25. “all that messuage or dwelling-house, with Garden, Stable, and Summer-house, situated on the West side of the High Street now in the occupation of Mrs Harriet Mawley. The House contains Two Front Sitting Rooms, Kitchen, Back Kitchen with workshop over, China Pantry, Four Bed Rooms, Large Cellar, Rain-water Cistern, and other domestic offices. The Premises may be easily converted into a Shop or for other business purposes, for which they are eligibly situated“. On 17th March 1869 the property was sold by all the interested parties in accordance with the will of George Luce. These were Harriet Mawley, Harriet Luce Mawley, Ellis Chambers and his wife Harriett Luce (nee Hodsall), Kingston Read and his wife, Mary, and James Tooley and his wife, Lucy Victoria. The income tax records show that Harriet Mawley was entitled to a moiety or half of the £280 made from the sale of 22 High Street, which was to be passed to her daughter Harriet Luce Mawley. The three children of Mary Hodsoll were entitled to one sixth share each of the £280 (being equal thirds of their mother’s half share). Henry James Dodd – on 17th March 1869 Henry bought the property for £280. In the 1871 census he is listed as a retired general shopkeeper aged 56 born in Ashborough in Norfolk. He was living there with his wife, Hester Dodd aged 58 from Alveston. On October 7th 1837 Henry married Hester Wilcox in Olveston in Gloucestershire. Hester of the daughter of Robert and Elizabeth Wilcox and the brother of William Radford Wilcox who had run a grocer’s shop at 43 High Street in the 1830’s and early 1840’s. The 1841 census shows that they settled in Olveston and Henry was a draper and grocer. They were living there with their daughter, Ann aged 2. The 1851 census shows the family in Olveston Street, Olveston. It shows that Ann Elizabeth was born in Wickwar and they also had two extra children, Thomas Henry aged 9 and Hannah Hester aged 5, both born in Olveston. 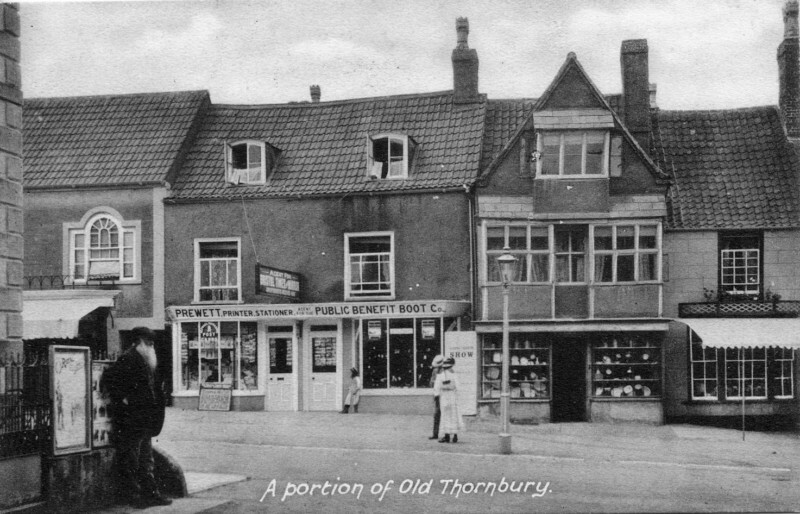 By the 1859 Rate Book Henry had moved to Thornbury. He appears to have taken over the ownership of 9 High Street and was living there. The 1861 census shows Henry, was a grocer, draper and outfitter at 7 High Street. Of his children, only Hester Hannah was living with them – she was aged 15 and now helping in the business. His son, Thomas Henry and sister Ann Elizabeth were living in Poole where they had a drapery business there which employed two assistants and a porter. In 1861 Ann married Edwin Boyes Lonnen and they settled in Thornbury. Thomas Henry also returned to Thornbury and married Frances Jane Powell at the Independent Chapel on 3rd April 1862. The 1862 Rate Book still shows Henry as the owner and occupant of 9 High Street. In 1864 Henry’s daughter, Hester Hannah died. Henry’s son, Thomas Henry died aged 25 on 4th July 1867. Click here to read about Thomas Henry Dodd. The 1867 Rate Book shows that Edwin Lonnen had taken over the running of the shop at 9 High Street previously occupied by his father-in-law, Henry James Dodd, although Henry still owned it. In 1871 Henry retired from the shop and moved with Hester to live in 22 High Street. It’s possible that Hester was not well as she died of apoplexy on 7th April 1871 aged 58. On 19th October 1872 Henry re-married – his second wife was Jemima youngest daughter of W. Ball of Staple Hill Lodge near Bristol. Initially Henry was renting 22 High Street owned by Obed Edward Thurston. However the 1880 Rate Book shows that Henry had become the owner of 22 High Street, but he had moved away. The name of tenant was shown as being ‘W. Cole’ but the name was crossed through which generally means he had also moved away. The 1881 census shows Henry James and Jemima had gone to live with her sister Mary Strange Roach in Clevedon. In the same Census Edwin and Ann Lonnen were living in the High Street in Poole in Dorset. Henry James Dodd died on 5th December 1885 aged 71. Although he died in Clevedon, he was buried at what is now known as the United Reformed Church in Thornbury in the same grave as his son, Thomas Henry. On 15th February 1886 Henry’s executors, his daughter, Ann Lonnen and her son, Thomas Henry, sold the property to Charles Fry for £310. In the 1881 census 22 High Street was unoccupied. The 1885 Rate Book shows the property was still owned by H. J. Dodd but occupied by Charles Fry. Charles Fry – Charles was a saddler and harness maker. He was shown as the tenant of 22 High Street in the 1885 Rate Book, but on 15th February 1886 he bought the property for £310. Charles was baptised on 1st August 1858, the son of George Fry a tailor and his wife, Elizabeth. Charles married on 5th May 1881. He wife was Ellen Lester, the daughter of John Lester, a gardener and his wife, Elizabeth. George and Ellen had several children: Fanny Elizabeth baptised on 28th June 1882, Elsie Ellen baptised on 9th October 1884, Mary Grace baptised on 3rd April 1887, Lucy Annie baptised on 5th December 1888, Charles Colston baptised on 22nd July 1892 and George John baptised on 29th May 1896. Of these children, Mary Grace died aged 9 months and was buried on 30th July 1887. The 1891 census shows Charles at 22 High Street. He was living there with his wife, Ellen a dressmaker aged 31 and their children: Fanny Elizabeth aged 8, Elsie Ellen aged 6, Lucy Annie aged 2 and Hilda May aged 7 months. The photo on the left shows the shop advertising it as ‘Fry, saddler’. Charles Fry was elected councillor in March 1898 and he was a “carnal” of Thornbury Court Leet in 1898. He failed to be elected to the Council in 1899 when there was a campaign to elect only those councillors who supported an application to remove the ban on the sale of intoxicating liquor in the Cossham Hall. We assume Charles was a supporter of this campaign which appears to have failed as Stafford Howard, a leader of the Temperance Movement in the Town won the election easily. It appears that Charles gave up his shop at 22 High Street around 1899. There was a notice in the Bristol Mercury that with effect from 24th June 1899 the licence of ‘the Ship’ at Tytherington was transferred to him from Elizabeth Phillimore. He still had his Thornbury connections however and in November 1899 the meeting of the Court Leet shows that Charles was still sworn to be a jury man. The thumbnail photograph on the right shows Charles, Ellen and their children about 1900. Click on the thumbnail to see a larger image. A notice of sale printed in the South Gloucestershire Chronicle on 3rd March 1900 shows that Charles had moved from the High Street and was trying to sell the property. By 1901 Charles had moved to Tytherington where he was innkeeper at The Swan. At the time of the census they had four children living with them Fanny aged 18, Hilda aged 11, Charles aged 8 and George aged 5. The 1901 census shows that, although Frances Gayner had bought 22 High Street, it was occupied at that time by Charles’s parents, one of his sisters, an uncle and a boarder. George Fry was described as a tailor aged 77 living with Elizabeth aged 80 and Charles’s sister, Ursula P Chandler was a widow aged 56. William Powell, described as George’s brother-in-law aged 81. The boarder was George H. Low, a school teacher (Board) aged 24 from Bristol. An indenture dated 17th August 1903 shows that Charles still owed £300 borrowed from Eliza Young and he was forced to sell the property for £725. The purchaser was Albert Prewett. In 1908 Charles bought a house at 19 St John Street for £120. It doesn’t seem as if Charles lived in this house. Charles and Ellen were still at The Swan in Tytherington in the 1911 census and in 1913 when his father died. In 1911 only their son, George John, was living with them. We know that Charles’s son, Charles Colston Fry, joined the merchant navy as he was issued with the Mercantile Marine Medal in 1919. Ernest Percy Weatherhead and Frank Symes – a notice of sale printed in the South Gloucestershire Chronicle on 3rd March 1900 shows that Charles Fry had moved from the High Street. The advert described the property as a ‘freehold dwelling house with 2 shops garden etc in High Street formerly occupied by Charles Fry and now in possession of Messrs EP Weatherhead and F. Symes – sold to Mr F. Gayner for £670‘. Each of these traders had their main premises further down the High Street so we don’t know why they wanted this property and what they did with it. By 1905 they had vacated number 22.